Osteopathic medicine is a unique form of American medical care that was developed by Andrew Taylor Still, M.D. Dr. Still was dissatisfied with the effectiveness of 19th century medicine. He believed that many of the medications of his day were useless or even harmful. Dr. Still was one of the first in his time to study the attributes of good health so that he could better understand the process of disease. In response Dr. Still founded a philosophy of medicine based on ideas that date back to Hippocrates, the Father of Medicine. The philosophy focuses on the unity of all body parts. He identified the musculoskeletal system as a key element of health. He recognized the body's ability to heal itself and stressed preventative medicine, eating properly, and keeping fit. Dr. Still pioneered the concept of wellness over 100 years ago. In today's terms, personal health risks such as smoking, high blood pressure, excessive cholesterol levels, stress levels and other lifestyle factors, are evaluated for each individual. In coordination with appropriate medical treatment, the Osteopathic Physician acts as a teacher to help patients take more responsibility for their own well being and change unhealthy patterns. Sports medicine is also a natural outgrowth of Osteopathic practice because of its focus on the musculoskeletal system, Osteopathic Manipulative Treatment, diet, exercise, and fitness. Many professional sports team physicians, Olympic physicians and personal sports medicine physicians are D.O.s. How is a D.O. different than an M.D.? - Both D.O.s and M.D.s complete four years of basic medical education. - After medical school both D.O.s and M.D.s can choose to practice in a specialty area of medicine such as psychiatry, surgery, or obstetrics, after completing a residency program (typically two to six years of additional training). - D.O.s practice a holistic, "whole person" approach to medicine. Instead of treating specific symptoms or illnesses, they regard your body as an integrated whole. - Osteopathic physicians focus on preventative healthcare. - D.O.s receive particular training in the musculoskeletal system, your body's interconnected system of nerves, muscles, and bones that make up two-thirds of its body mass. This training provides Osteopathic Physicians with a better understanding of the ways that an injury or illness in one part of the body can affect another. It gives D.O.s a therapeutic and diagnostic advantage over those who do not receive additional training. 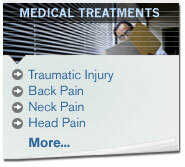 - Osteopathic Manipulative Treatment (OMT) is incorporated in the training and practice of Osteopathic Physicians. With OMT, Osteopathic Physicians use their hands to diagnose injury and illness and encourage your body's natural tendency towards good health. By combining all other medical procedures with OMT, D.O.s offer their patients the most comprehensive care available in medicine today.